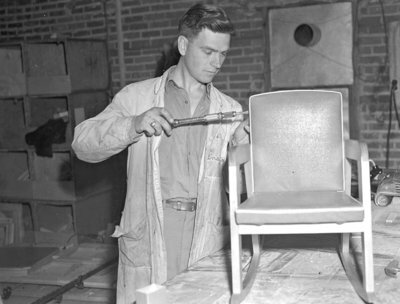 Black and white negative showing an unidentified man putting screws into a chair at Woodland Products. Woodland Products was started by two Whitby war veterans in early 1946. Woodland Products, 1946, Marjorie Ruddy. Whitby Archives, 15-016-001.